‘Project Cycle Ops – a London-wide project between Transport for London (TfL) and the police – has resulted in an 11 per cent fall in bike theft, with over 2,000 fewer offences. The collaboration – between TfL, the Metropolitan Police Service, British Transport Police and the City of London Police – started in October 2012. The number of bike thefts in London from October 2012 to the end of August 2013 was 19,052, compared with 21,488 in 2012 and 20,411 in 2011 over the same time period. Against a three-year average (used to flatten out fluctuations caused by spells of extreme weather) bike theft is down by 10.3 per cent. "Many people who have their bikes stolen simply give up cycling, so cracking down on this crime is essential for the Mayor’s ambition to double the number of cyclists," said Andrew Gilligan, the Mayor of London’s Cycling Commissioner. "In the months ahead, you will see more initiatives from us to pile further pressure on the thieves and shrink the market in stolen bikes." A variety of activities have been employed in Project Cycle Ops, including bike marking and registration events, educating cyclists, high-visibility policing patrols to discourage thieves, surveillance, and special undercover policing tactics. Five thieves have been given ASBOs to prevent them from having a bike they can not prove they legitimately own. During Project Cycle Ops police have security marked and registered over 40,000 bikes on BikeRegister.com, which helps to deter thieves and reunite people with their bikes if they are lost or stolen. However, they still have over 2,000 unclaimed bikes held in London police stations and have a photo gallery site in an attempt to get bikes back to their owners. TfL and the police joined forces with BikeRegister on a marketing campaign to encourage people to get their bikes security marked and registered, and insist on proof of ownership and bike registration numbers before making a purchase. 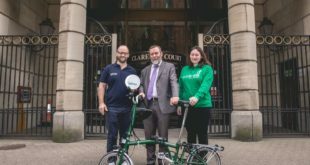 In addition, they worked with Gumtree to help get this message out to the public; as a result, cycle security pop-up messages are now seen on the site by anyone looking to buy a bike, along with updated guidance and a dedicated cycle security blog. Police have also worked behind the scenes with the site to catch the bike thieves in the act as they attempted to sell bikes and bike parts online – cutting off one of their marketplaces and making it much more difficult for criminals to make money from this kind of crime.